We rely heavily on the Lonely Planet guides when we're traveling and our 1,000-page volume on Indonesia shows a lot of wear. The guide had several glowing comments about the Gili islands, saying that they're 'irresistable' and that there's 'serenity with no motorized traffic . .' but as we approached the small bay we found it chock full of cruising boats that were rolling badly from the wake caused by ferries bringing in waves of tourists. After making one pass through the anchorage, we turned south to an anchorage a mile-and-a-half away on Lombok Island where we spent a very pleasant afternoon. Just before sunset, we weighed anchor and, heading west again, made our way to Bali. It was just after sunrise when we found Lovina Beach on Bali's northern shore. From the water it appears to be nothing more than an open roadstead but there is a protecting reef on it's eastern edge. Already eight boats were anchored there so we didn't have any trouble finding a spot to drop the hook and it was refreshing to feel it sink into the dark sand bottom. Although it's not the calmest anchorage we've stayed in, the motion isn't too bad and the prevailing winds are generally offshore. No sooner had we pulled the dinghy onto the steep, wide sand beach when we were approached by several locals, all asking questions about ourselves. We had learned that this is typical Indonesian behavior but Westerners are often taken aback with their somewhat personal inquiries. "Where are you from?" "What is your name?" "How many people are on your boat?" "How long are you staying?" "Where are you going?" "What are you doing tomorrow?" Just beyond the beach is a long string of small store fronts that sell all of the Balinese tourist junk. The store owners are masters at getting you to make a commitment to visit their store and their bargaining skills are second to none. Still, we found it to be delightful and it would be still several days before we were thoroughly worn out from the constant barrage of locals wanting to provide us with taxis or massages. 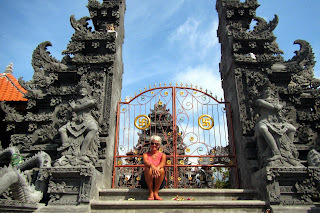 However, once we got away from the beach front, we could feel the magic of Bali. This was a different Indonesia that we had seen. Being predominantly Hindu, every home and every store has a shrine or small temple. Every village has at least three temples and people place 'offerings' - small freshly-woven baskets that contain flowers, candy and incense - on the ground in front of their businesses, homes or on any one of the millions of statues that are found everywhere. The traffic is a little insane but there's still a certain serenity - maybe it's the way people put their hands together in front of their chests and bow slightly - I'm not sure what it is exactly but we're completely taken with it. The bright green rice fields are almost everywhere there's a scrap of flat land and the thick tropical forest grows right to the field's edge. Sadly, there's still wide-spread poverty with many families unable to come up with the US$250 for annual school tuition. 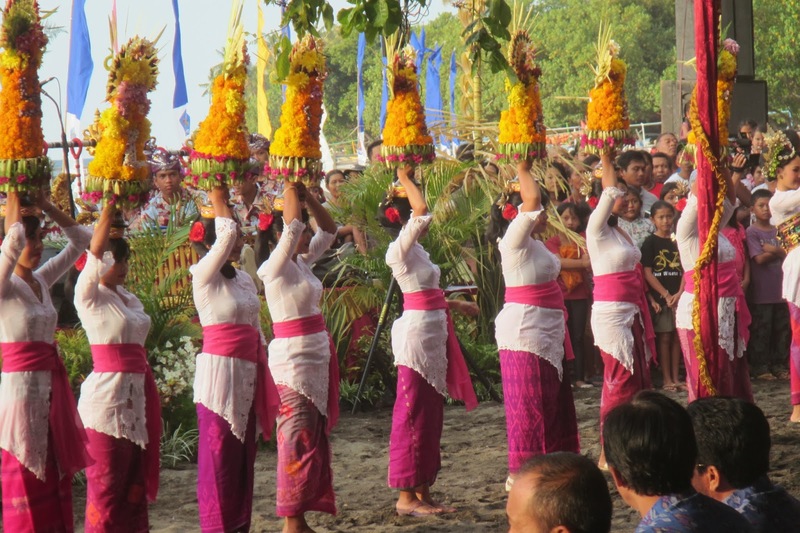 Would we be so in love with Bali if things were expensive? I like to think so but they're not and it makes the island even easier to love. The current exchange rate is 11,450 rupiah to US$1.00. A large 650ml Bintang beer in an upscale restaurant is about 35,000 rupiah or about US$3.00. A huge plate of mei goreng (fried noodles with fresh vegetables - one of my favorites) is about the same price. So, for about US$6.00, you can get a huge lunch with a very tall cold beer and that's if you want a full sit-down restaurant. If you're willing to settle for a street vendor, it's a fraction of the cost. There's a fairly large expat community here and we've spoken with some Americans who live here now. They tell us you can rent a very nice house here for about US$1,200 per year! An enormous stage, complete with a sophisticated lighting and sound system was erected for the Sail Indonesia welcome. Banners lined the beach and within a couple of days of our arrival, more than 50 cruising boats filled the bay. There were speeches and parades, dancing and dinner. The festivities often go on late into the night. 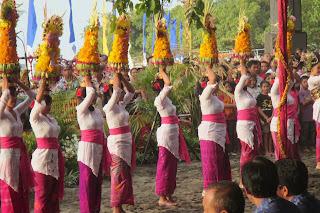 While we love a good party as much as anyone, the lure of Bali's inland was pulling on us strongly so we quickly made arrangements to leave the coast and explore other parts of this unique island.